The CHC-125 has improved heat transfer over the earlier CHC-120-V06. It is designed to provide high efficiency liquid cooling for motherboard northbridge or southbridge chipsets (including those below PCI-Express cards), or heat sources up to approximately 175W. Materials include a solid high-density copper cold plate, brass top, and anti-corrosive nickel plating. The CHC-125 also has 360-degree rotational sockets, enabling the use of Koolance G 1/4 BSP threaded nozzles of any diameter and type (nozzles not included). 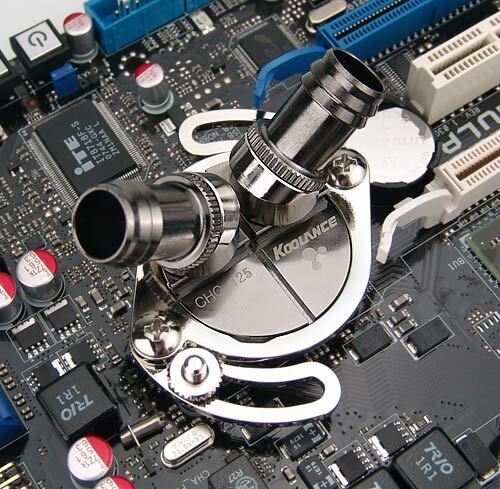 While mounting a southbridge chipset, the offset swiveling nozzles retain the ability to avoid most PCI-Express video card conflicts. Overall dimensions 1.5" x 1.5" x 0.43".